Ever wonder what Santa and his friends do the rest of the year? This is the place to keep up with his summertime travels. Christmas 2000 was a very hectic one. What with the ever increasing population and such, it put an extra load on everyone, so Santa planned a big New Years Eve party to help everyone unwind. The hit of the night was the grand finale starring Dasher, Dancer, Donder and Blitzen, twins Billy and Willie Elf and of course Santa Claus himself. After the party, the elves sent Santa off for a much deserved rest, while they set to work cleaning up around the workshop. Once finished, it was time to make the big plans. Everyone wanted Santa's attention with their ideas but Santa knew better. He called a meeting to get everyone's ideas. Finally, all was decided and it was off to the internet to make all the arrangements. 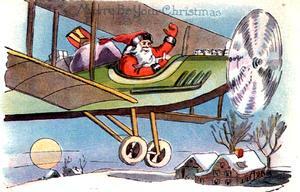 Santa gassed up the plane, and they were off. Click on a month below to follow their travels.